Key Difference: Scuba Diving and Snorkelling both are underwater sport adventure and recreational activity enjoyed around the world. The main difference between both the terms is that the scuba diver will be provided with an oxygen tank on his or her back to breathe from it underwater. A scuba diver does not need to be necessarily be a swimmer and if we remove the oxygen tank from the diver's suit then the activity is known as Snorkelling. Snorkelling is actually swimming with a snorkel, which is a tube and a mask that allows the swimmer to breathe through the mouth while swimming underwater. Both the sports also differ in terms of techniques like snorkelling does not require any training, whereas scuba diving needs proper training. Scuba is acronym for Self Contained Underwater Breathing Apparatus. The divers can enjoy the independency to actually have their personal space and need not learn swimming to enjoy this activity. Divers will have the freedom to deep dive underwater to explore the coral reefs, flora and fauna and other water bodies through their own breathing equipment or air supply, usually compressed gas carried weightlessly on their backs. This sports allows the diver to go deep underwater for exploration of beauty with a tight fitting diving suit and breathing through an oxygen tank. The diver primarily moves underwater using fins attached to the feet as a part of the body suit and other equipment includes a mask to improve underwater vision. The eqipment is more complex as heavier as compare to that of snorkelling. The equipment comprises of a pressurised gas tank with most common used mixture called as Nitrox also known as Enriched Air Nitrox (EAN), which is air with extra oxygen generally with 32% to 36% extra oxygen and less nitrogen. This oxygen helps in minimising the risk of the any sickness like Decompression Sickness. Mostly the activity is done using a half mask that covers the diver's eye and a nose and a mouthpiece to supply the breathing gas from the rebreather the other common arrangement is a full face mask which covers the eye, nose and the mouth, and often allows the diver's to breathe through the nose. Professional Scuba divers are more likely to use full face, which protect the diver's airway if the diver loses consciousness. The most commonly used scuba set uses a single hose and has a open circuit with 2- stage regulator that i s connected to a single back-mounted high-pressure gas cylinder, in which the first stage is connected to the cylinder and the second stage at the mouth piece. Scuba Diving requires more training before diving in the water than compared to snorkelling. 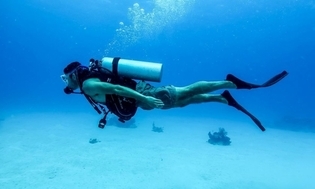 Since the diver goes well below the surface level, proper breathing techniques using tank or tube needs to be practised and understand all about the precautions one should take during the activity. As one descends, the diver experiences additional pressure on lungs and chest because of water depth, so thus should know all the signs to communicate with the trainer, if accompanied with the diver. The training may seem exstensive and expensive but are sometimes necessary as proofs of being a certified diver to enjoy the activitty. Many resorts and course hosts such training programmes. Scuba Diving may have certain risk and effects on health including adverse effects of breathing compressed air like decompression sickness, oxygen toxicity, refraction, nitrogen narcosis and underwater vision. Snorkelling is simply swimming along the surface of the water and looking down at the oceanic activity and enjoying the underwater life. No special training or skill is required except for underwater swimming and the equipment needed is minimal. It is a practise of swimming on or through body of water while equiped with diving mask, a shaped breathing tube called Snorkel and usually with swimfins. The equipment allows the snorkeller to explore underwater life for extended periods with little effort. Snorkelling is a popular recreational activity, particularly at tropical locations. The activity has more appeal than scuba diving, as this requires no training and less equipment and is based on swimming on water surface. Snorkelling is also used by scuba divers when on the surface, in underwater sports like underwater rugby or underwater hockey and also a part of water-based searches conducted by search and rescue teams. Both scuba divers and snorkellers can have diving masks made up of single lense or multiple lenses and latter can even be made to accomodate the divers and snorkellers who need vision correction. For snorkelling, the equipment needed can may be a separate item or maybe an integrated one with a full-face snorkelling mask and is only suitable for surface snorkeling. The separate snorkel may also be used for free-diving for surface breathing with scuba equipment. The swimmers' snorkel is tube typically about 30 centimeters long with an inside diameter of betweem 1.5 and 2.5 centimeter, usually J-shaped or L-shaped and fitted with a mouthpiece at the lower end, which is constructed of plastic or rubber and is used for breathing air above the water surface, when the swimmer's mouth and nose are submerged in water. The snorkel usually has a piece of rubber that attaches the snorkel to the outside of the strap of the diving mask. Some snorkellers also may want to use foot fins to move faster with less efforts on the surface. This requires no training and someone who has snokelled before can enjoy with basic swimming knowledge. Generally shallow reef is of one to four meters sea level are favoured by snorkel. Deeper reefs increases the bar with fitness level and repeated holding breaths in those depths limits the number of practioners. The Technique used in snorkelling is that the swimmers' nose and mouth are submerged in water and are covered by a mask. The mouthpiece connected with L or J shaped tube helps with air for breathing. The air is supplied from above the water surface. The swimmer needs to hold his breath while deep diving. The snorkel tube can flood the water and thus the snorkeller expels water from the equipment either with a sharp exhalation of the breath on return to the water surface. There is another technique called the displacement method that is by titting the head back shortly before reaching the surface level and face forward again before inhaling the next breath. This method expels the water by displacing the water and replacing it with air. This technique is more advanced and take practise but is very effective in clearing the snorkel. Snorkellers are hard to spot in the water by jet skis and leisure crafts, since a diver is submerged under water with only a tube sticking emerging out of water and thus is the greatest danger of snorkelling. Other health hazards are hyperventillation, dehydration and coming in contact with poisonous coral. Spending long hours for snorkeling can also cause sun burn as the back is exposed to sun during the activity. including wreck diving, cave diving, ice diving. Professional purposes includes works related to Civil Engineering, underwater welding, military purposes or for offshore construction. Recreational Purposes including observing fishes, algae and coral reefs especially in water bodies with mnimal waves and warm waters and also other interesting things to see near the water surface. Can stay underwater longer as longer as one wants till the gas does not run empty as this does not need holding of breath. Need to hold breath to swim under the surface of the water. Pressurised gas tank strapped to the back of the diver with a single hose and open-circuit with a 2-stage diving regulator that is with the first stage attached to the gas tank and the second connected to the mouth piece with swim fin to the feet and a tight fitted diving suit. Diving mask which is L or J shaped tube whichis used for breathing and the air is supplied through the tube above the water surface level with a mouthpiece at the lower end and sometimes swim fins attached to the feet for faster movement. Requires training in how to use the breathing eequipment, sign language for underwater signals, safety procedures, and troubleshooting. Requires no training. Swimmers' favour shallow reefs ranging from 3 to 12 feet. Deeper reefs needs repeated holding breaths with high level of body fitness, swimming and breathing practise and this indirectly creates limits for availability of practioners with certain required skill set for such depths. Some places needs divers to have proofs and certification provided by the trainer for diving and for techniques. Needs no specific certification or training proof. The swimmer's entire body is under the water. The diver's eyes and nose are covered by a diving mask; the diver's cannot breathe in through the nose, except while he is wearing a full face diving mask, but quickly adaps to inhaling through the regulator's mouthpiece. The swimmer's head and nose are underwater. The snorkel tube can flood the water. The snorkel expels water either by a sharp exhalation on return to the water surface or by titlting the head back shortly before reaching the surface. Health effects are decompression sickness due to the compressed air in the gas tank, nitrogen narcosis, oxygen toxicity, refraction and underwater vision. Greatest danger is not being spotted by jet skis as diver is often submerged under water with only their breathing tube extending out above the surface level. Contact with poisonous reefs, hyperventilation and dehydration. Other effects are sun burn due to back exposed to sun for long hours.